From time to time, many of us flit into bird photography, whether it’s while looking out of the window into the garden or on a more deliberate trip, such as a falconry experience day. But rarely do most people plan ahead for more than a few shots; often getting what they can on the day after playing around with settings. Bird photography might sound difficult, but with a plan and the right camera settings you can get great photos. If you find a popular location and arrive a little early to set up, you can nail fantastic shots in just an hour or so. Here we’re being ambitious, by photographing a whole swooping and swirling flock of birds. The hypnotising shapes that starling murmurations make at dusk are famous, but plenty of other bird species also create wonderful fluid patterns as they fly in a flock, so these tips work in any area and at any time of year. 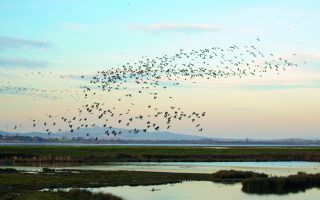 Find a location that’s known to have flocks of birds, and find out when the best time to visit is. We went to WWT Slimbridge Wetland Centre, which has thousands of birds, including lapwings, rooks and starlings that flock reliably around one hour before dusk. Permanent hides at reserves are great starting points for beginner bird photographers as they are placed in areas where birds gather regularly, they’re quiet and usually have seating. If your location doesn’t have any, take your own portable hide for a little shelter from the elements. If the birds are moving around quickly, be sure to use group mode in your autofocus settings. That way the autofocus area will be larger, making it easier to track their movements through the sky. If you’re more confident, single point autofocus will work just as well. Stick to manual and aperture priority modes for this sort of shoot – especially the latter. We shot wide open at f/2.8 to give us a really fast 1/4000 sec shutter speed, and we used up to ISO450 to ensure we were getting a fast shutter speed. It’s easy to get restless in a quiet hide and to fall into the trap of checking your camera to keep busy, but don’t lose focus on the birds. You might miss opportunities if you’re looking the wrong way or down at your camera. Nail your settings first and keep your eyes peeled. Resist the urge to zoom in too close, as it’ll spoil the effect of the birds creating patterns en masse. Rather, set a distance where you can see the flock and some of the landscape. That being said, sometimes cropping closer so that the flock fills the frame will emphasise the mass. Look out for interesting patterns, especially as the flock turns. As the birds bank they’ll appear larger and darker, and with some interesting clouds behind, the shot will look textured. Keep shooting as new patterns appear (make sure your memory card has enough space).